Von Epix Haven kommt ein Kickstarter für STL-Files zu ihren Gebäuden. 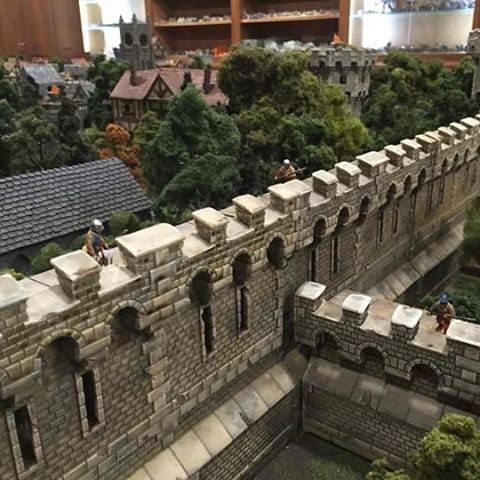 EPIX HAVEN is THE terrain for your role playing and war gaming tables! Until now, you’d have to buy the prepainted, suitcased models from stores like Amazon. But today; pledge and print the models you love and want! This multi-level terrain is used by gaming icons as Matthew Mercer, Wil Wheaton and Sam Haley, being given the seal of excellence and five stars ratings. Now; YOU can have all the terrain you want for your RPG or wargame from your home 3D printer! Just do a google image search for Epix Haven to see what we’re talking about! 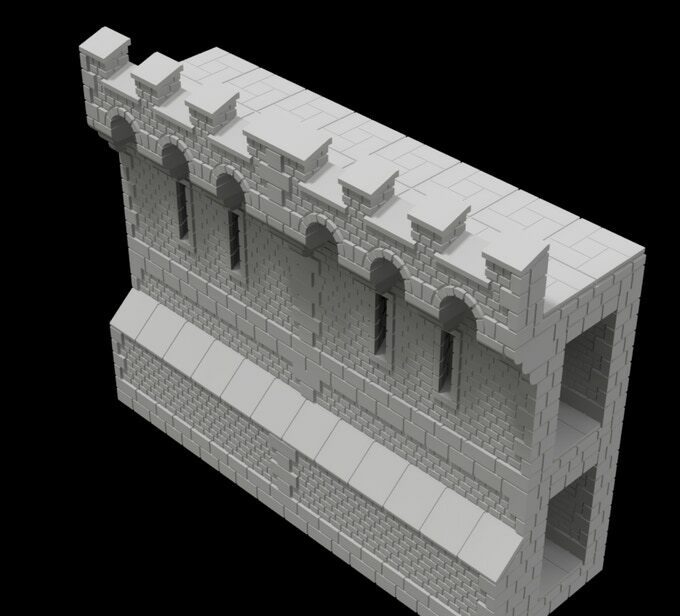 Each model is delivered in.stl format, and once you have the model, you can print as many pieces as you like and never run out or have to purchase more! These models are the Improved Edition (v. 1.5) of the original Epix Haven models! Valuable and continous feedback from customers of the original models has enabled us to enhance them in certain ways, so now our models looks and play better than ever! And YOU may be a part of this! (See the FAQ for additional info on different editions). By supporting us through Kickstarter, you also get access to ALL stretch rewards for FREE, given to anyone pledging at the NOK 350 ($ 45) level or higher. Rise your banner and spread the word about this Kickstarter and post about it on Facebook, Twitter etc., and get FREE bonus models as the pledges rise! But there’s more! If this campaign proves a mighty success, we’ll unleash the Rewamped Edition of the models; v. 2.0! More on this in the Stretch Goal area (and the FAQ)! An Epix Haven Tower at Amazon has a retail price of $139.99. Printing this yourself will cost you a fraction of this price. 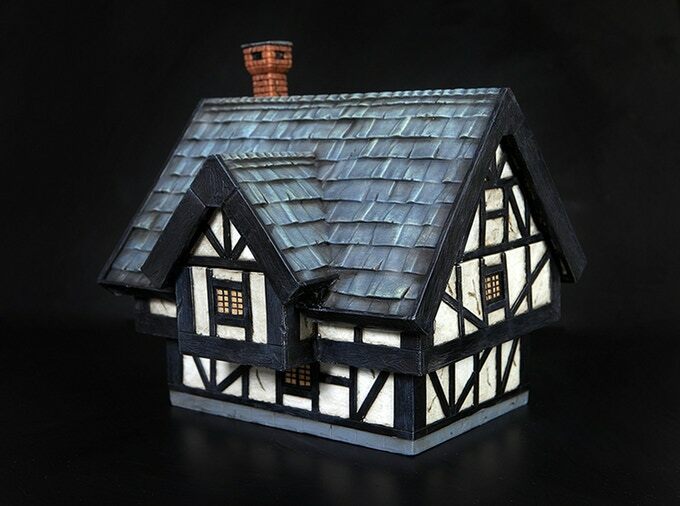 Of course; the original Epix Haven products are made in solid resin and hand painted (read more in the Add-on section), but for anyone looking for ready to print-n-play terrain; this is the best offer there is! You may not own a 3D printer at the moment, but it benefits you to support this campaign now: You can grab all the free stretch rewards and have a full set of Epix Haven terrain ready to print when you do purchase a printer, or have the models printed somewhere else (see the FAQ for suggestions). Though the models are designed for 28 mm gaming, you may easily adjust this in your 3D printing software, generating terrain for 10mm, 15mm, 32 mm or whatever size you want! (See FAQ for details). Our add-ons are the original hand painted Epix Haven terrain in solid resin, individually crafted in all its glory, presented in an exclusive storage case for safe keeping and transportation at discounted, KS-exclusive prices! You can get any or all of these models by adding the appropriate amount for them to your total pledge. 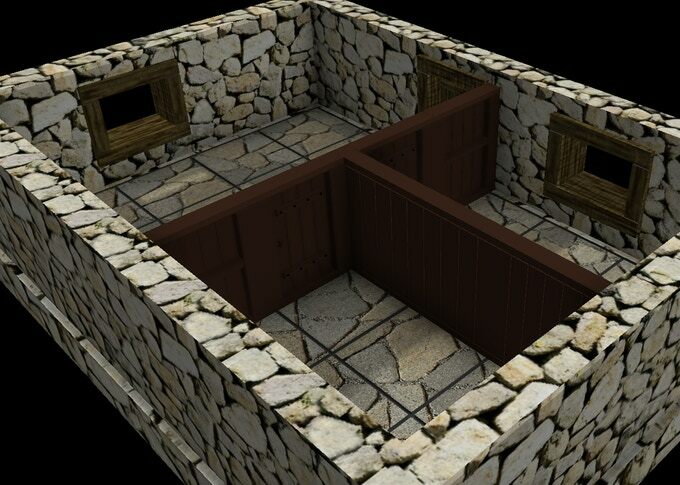 So if you want to add the Stone House ($50) to your existing $45 level pledge, you would need to change your pledge to $95, and then in the after-campaign survey, write that the extra $50 was for a Stone House. Stairs weighs 2 kilos, Stone House 4 kilos, Gate 8 kilos, the rest 6 kilos each. Remember to add shipping costs using the link above, convertion rate USD 1 = 8 NOK (ex. NOK 400 equals USD 50). One more add-on; you may also buy the ORIGINAL Epix Haven .stl-files (v.1.0)! These are NOT the Improved Edition of this campain (see the FAQ)! $ 50 will get you ALL the original models (this add-on will NOT make you eligible for any stretch goals, unless combined with pledging at the NOK 350 ($ 45) level or higher). 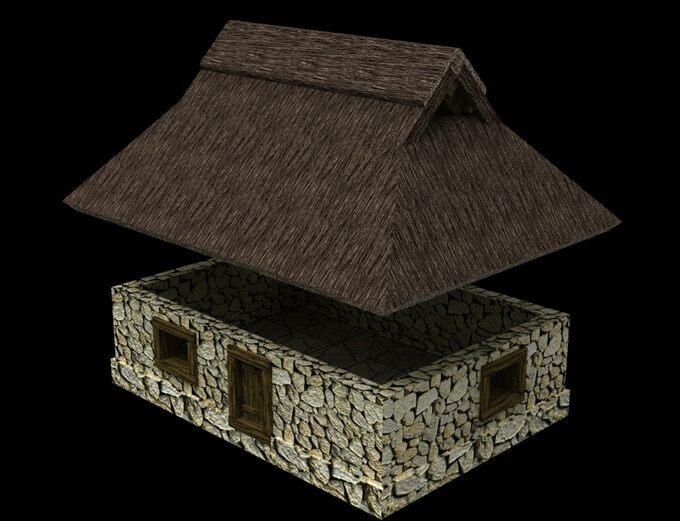 Individual small stones makes up the wall, impressive woodwork makes up the framing and a straw roof keeps the rain outside! Ideal for any miniature or RPG gaming taking place in the countryside! 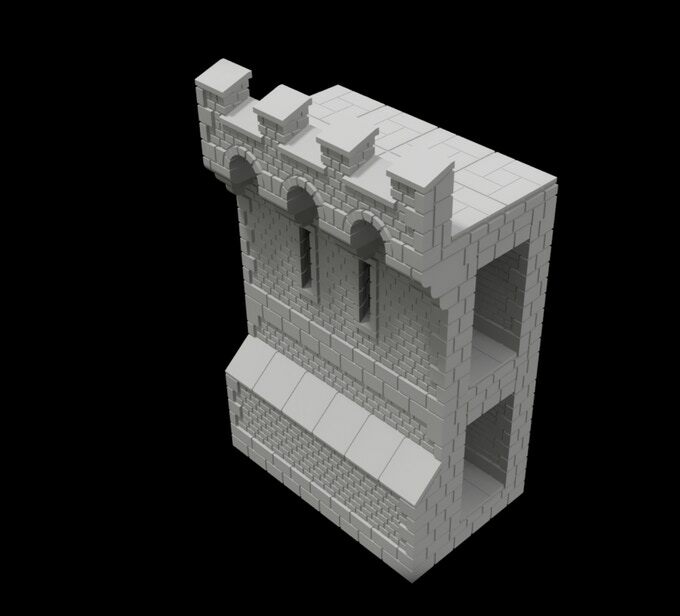 Rails, stairs, windows, chimney; this is as close to the real thing there is; only smaller and ideal for your gaming table! 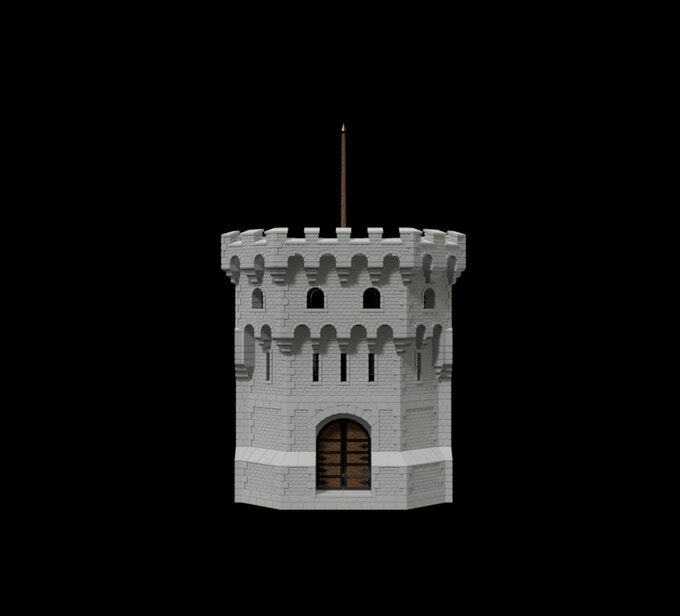 Do you need a guard tower? A wizards home? An outpost against raiding orcs? 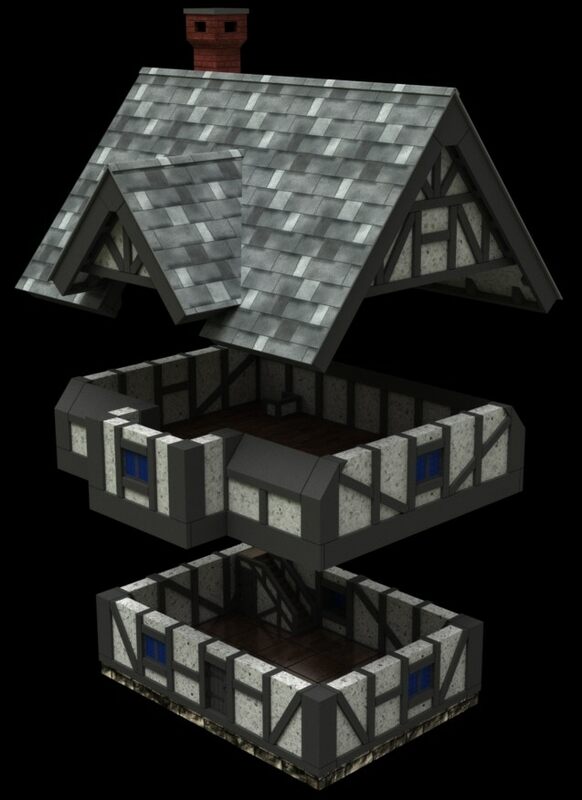 Both of our Towers will do any such job, with four playable floors. 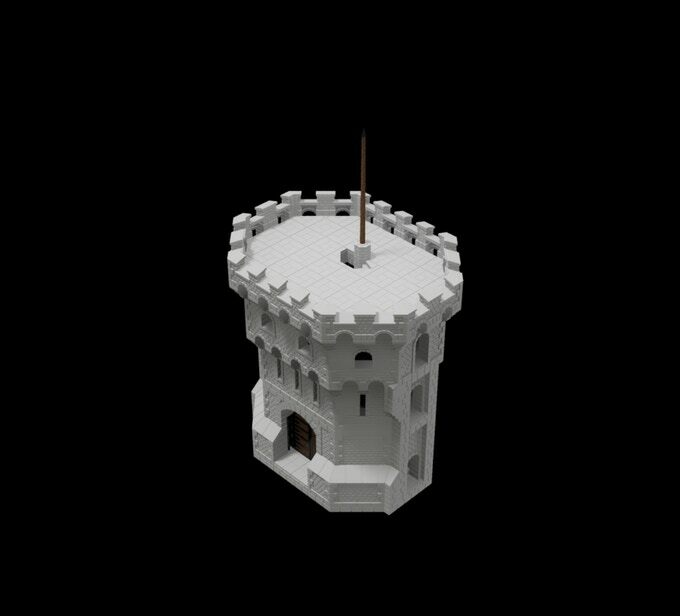 The Freestanding Tower has one entrance/door at the base, while the Corner Tower has additonal corridors to both sides; specially designed to work with our Wall and Gate to make a complete Castle Set. How many times haven’t players shouted „Hold the gate!“? Well, this model does the job! Four playable levels, rich in details with corridors, grates and holes to pour smoking tar from! 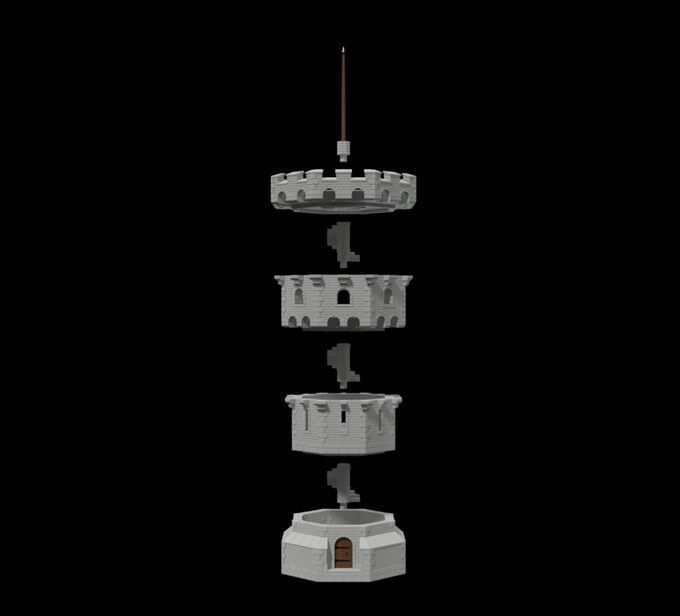 May very well be used stand alone, but specially designed to work with our Wall and Gate to make a complete Castle Set! 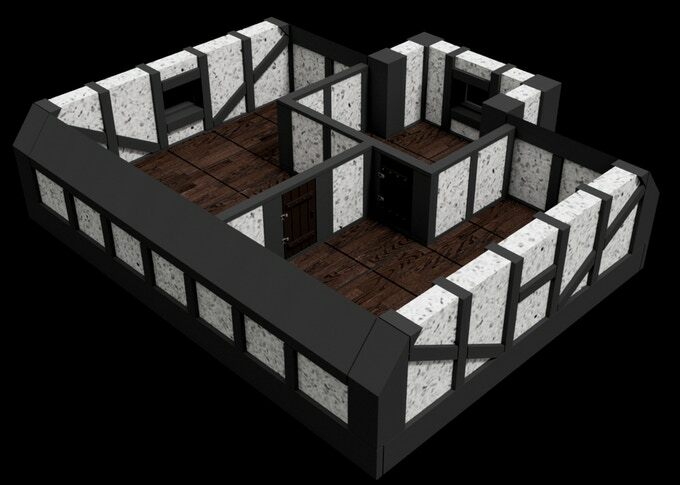 Three playable floors; even corridors inside to make deadly sneak attacks! 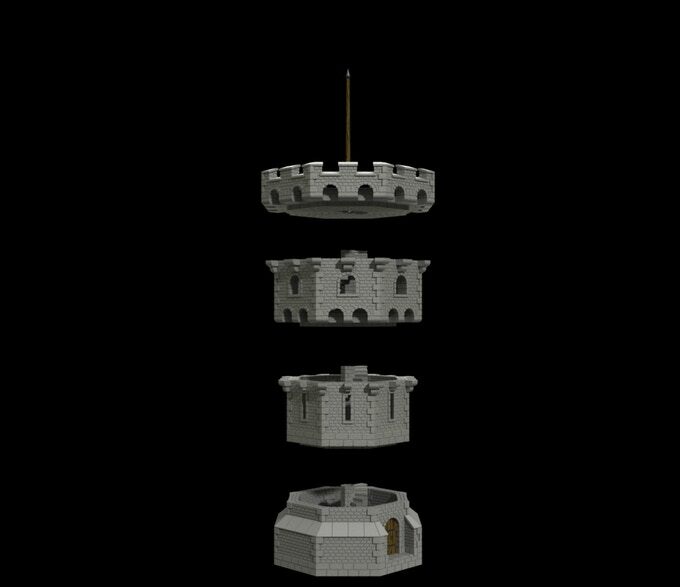 May very well be used stand alone, but specially designed to work with the Corner Tower and Gate to make a complete Castle Set! Some of our Stretch Goals models are ready, some are in development. As we unlock more of them, our design team will intensify their work and keep you updated through this Kickstarter with details and pictures! You’ll get them ALL FOR FREE as we unlock them, starting from pledge NOK 350 ($ 45) or higher! Our Stretch Goals includes Social Goals; yes, the more this campaign is shared at Facebook, the more FREE models will be unlocked!! If we hit NOK 300.000, we’ll unleash a REWAMPED set of existing Epix Haven terrain! 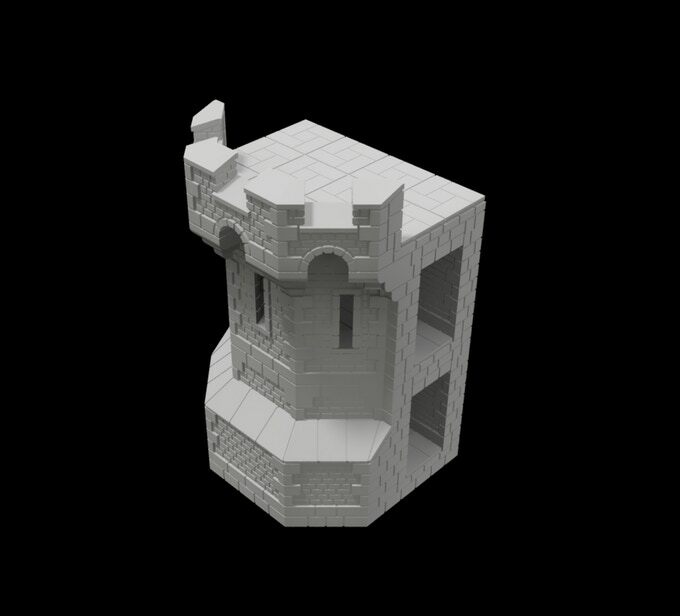 That’s right; we’ll redesign and distribute v. 2.0 of ALL the castle pledge models in this campaign FOR FREE for all backers starting from pledge NOK 350 ($ 45) or higher! These v. 2.0 sets will only be available during this campaign! They will come in addition to your original pledge, so you may chose the design you want! We’re ready to deliver all models in October except Stretch Goals; they are in development: Updates to follow as we unlock them! 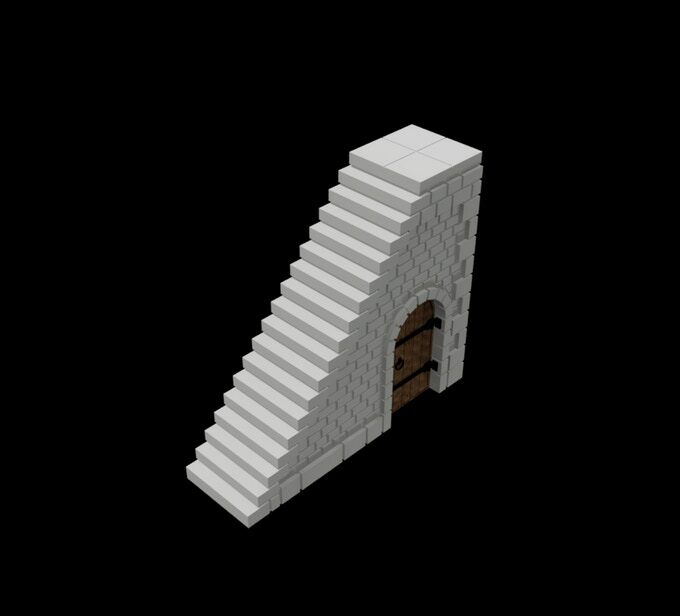 100 SHARES on Facebook for our Kickstarter Campaign: Stairs with doors. 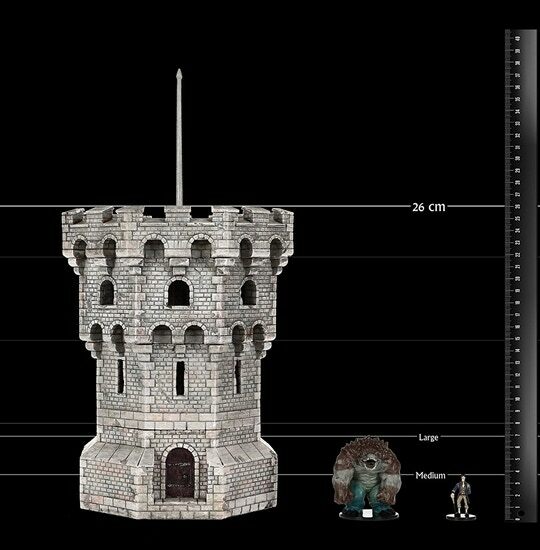 300 SHARES on Facebook for our Kickstarter Campaign: Mini Tower! Thanks to Kickstarter backers, we at Epix Haven launched our miniature terrain in USA and Europe in 2016/2017. 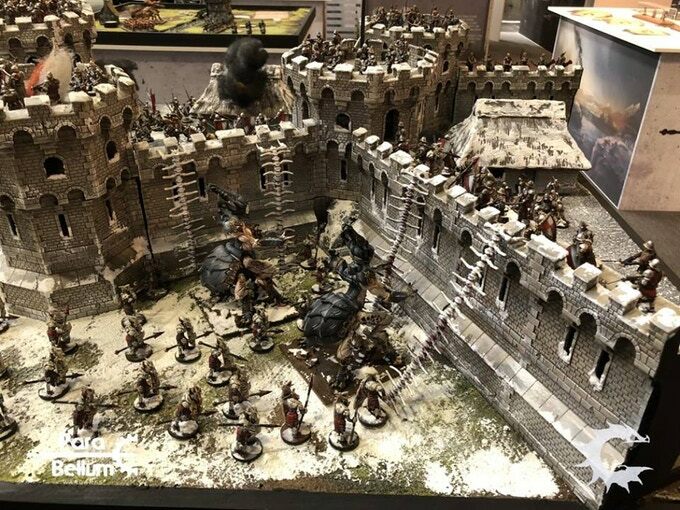 Our terrain is now used by gaming groups all over the world. We’ve received a lot of feedback, including ways to improve existing models or ideas for new ones. This Kickstarter is a response to those feedbacks. We’re modified some of the design of existing models (see FAQ) and wants to see new design ideas come into life. Our designers have worked on these models and variations for the last five years. If we hit the relevant Stretch Goals, their skills and knowledge will guarantee the highest quality and compliments to existing models. We’ll continuously update you while working on the Stretch Goals with pictures and sample files. Die Kampagne läuft noch 28 Tage und ist finanziert. sehr schön, aber weit Jenseits meines Budgets. Da wir gerade beim Thema Festung sind, kennt jemand abgesehen von Warhammer ein Spielsystem mit Belagerungsregeln? Joan of the arc, ist aber 15mm und wird erst im Dezember ausgeliefert. Der KS haut mich leider überhaupt nicht um. Hätte Drucker und Zeit, aber da springt der Funke einfach nicht über. In Kings of War gab es in der ersten Edition Belagerungsregeln. Ich weiß allerdings gerade nicht aus dem Stand ob die auch in der zweiten Edition schon aufgetaucht sind und wenn ja in welchem Buch…. Im Herr der Ringe Regelwerk von GW sind Regeln für Belagerung/ Belagerungsmaschinen drin. Die Burgen als Fertige Modelle gibt es ja schon ne weile. Auch wenn ich nirgend welche gesehen habe und google auch nicht mehr als ein paar Reviews ausgepuckt wo das material gestellt wurde. Man kann also davon ausgehen das es sich hier um „Liebhaberstücke“ handelt. Die STL Files jetzt noch schnell als kleinen Money Grab zu verticken macht da schon fast einen verzweifelten Eindruck. Aber wie gesagt da es keine belastbaren Daten gibt kann man das auch als rein subjektive Einschätzung abtun. Wobei mich die STL Files schon reizen würden…. Zwar wurde das Material auch gestellt, aber das ist ja nicht ungewöhnlich. Ich glaube irgendwann kommt man nicht mehr um einen 3D-Drucker nicht mehr rum. Traue mich nur noch nicht. Warum? Die Preise sind mittlerweile sehr günstig und die Einstiegshürde sehr gering.